The chances of society shaking its dependence on gasoline and oil are reliant on numerous profound societal, environmental and geopolitical factors. 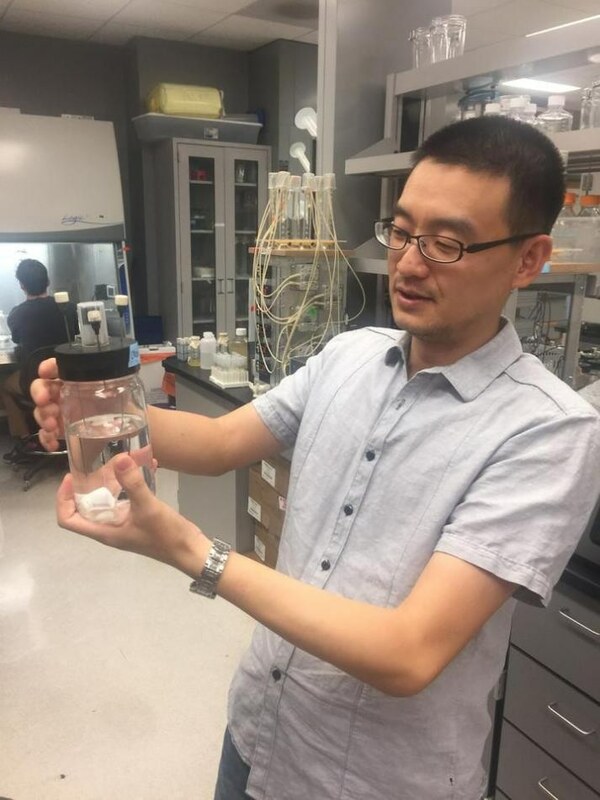 Xuan Wang holds one of the fermentation flasks used in the benchtop evolution experiments. CREDIT: Joe Caspermeyer, Biodesign Institute. However, as the price of oil at present is hovering around 50 dollars per barrel, it is not likely to happen in the near future. Regardless of various major national research strategies, no one has succeeded in proposing a progressive renewable biofuel technology that will result in an inexpensive substitute to gasoline. This induced Reed Cartwright and Xuan Wang, ASU Researchers, to collaborate with each other to attempt to solve the innovation bottleneck in the renewable bioproduction of chemicals and fuels. My lab has been very interested in converting biomass such as agricultural wastes and even carbon dioxide into useful and renewable bio-based products. As a microbiologist, I’m interested in manipulating microbes as biocatalysts to do a better job. To do this, they have employed an innovative technique—tapping the empirical power of evolution to persuade nature to disclose the key to this challenge. The Researchers cultured bacteria for many generations under specifically manipulated conditions in fermentation tanks, thereby producing test-tube evolved bacteria for fermenting sugars extracted from biomass, which is a potential and rich source of renewable energy for producing chemicals and biofuels, in a better way. The outcomes of the research have been reported in the latest online edition of the journal PNAS. Christian Sievert, Lizbeth Nieves, Larry Panyon, Taylor Loeffler, and Chandler Morris were the Co-Researchers of the study, which was headed by Reed Cartwright and Xuan Wang, as part of a partnership between the ASU’s School of Life Sciences and the Biodesign Institute. The appeal of plants is ideal. Just add a little carbon dioxide, water and plentiful sunshine and presto! Society has a rich new source of renewable carbons to use. Corn ethanol (using starch from corn for alcohol production primarily in the United States) has been one major biofuel avenue. Another alternative which is plentiful in Brazil is sugarcane. However, a major disadvantage of converting sugarcane or corn into ethanol is that it clashes with supplies of food. Hence, over many years in the past, Researchers have shifted their research focus on the transformation of non-food-based plant materials into chemicals and biofuels. Such lignocellulosic biomasses such as inedible portions of sugarcane and corn, for example, bagasses, stovers, husks, and so on, as well as tall switchgrasses have abundant amounts of xylose, an energy-rich, five-carbon sugar compound related to glucose. Although lignocellulosic biomass includes copious amounts of xylose and glucose, industrial Escherichia coli strains cannot make use of xylose. This is due to the fact that the presence of glucose hinders the use of xylose. Therefore, until now, the complete tapping and conversion of xylose into biofuels has not been very effective and is highly expensive. The goal of Wang and Cartwright was to tap greater amounts of energy from xylose sugars. For achieving this, they challenged the E. coli bacteria that could comfortably grow in the presence of glucose. They challenged the growth medium broth to make the bacteria to grow entirely on xylose. The bacteria would then be pressurized to either adjust to the new nutrient supply or to lose the growth competition. At the start, they employed a single colony of genetically identical bacteria and performed three separate evolution experiments by using xylose. Initially, the growth of the bacteria was very sluggish. However astonishingly, in no more than 150 generations, the bacteria could adjust and ultimately learned to thrive in the xylose medium. Subsequently, they isolated the DNA from the bacteria and used next-generation DNA sequencing technology to investigate the alterations within the bacteria genomes. Upon analyzing the DNA data, the Researchers were able to recognize the suggestive symptoms of evolution that occurred, namely, mutations. Upon being pressurized, the bacteria randomly mutated their DNA up to a point where they could adjust to the new conditions. The bacteria embraced the competent mutations over generations until they transformed into fixed favorable mutations. Moreover, at each step, when pressurized with xylose medium, the bacteria could multiply optimally. The next step was to identify the favorable mutations and analyze their function. For thriving on xylose in a better way, the three bacterial E. coli lines were found to have “discovered” a different set of mutations to the same genes. The single mutations identified by the Researchers were able to improve xylose fermentation by modifying bacterial sugar metabolism. This suggests that there are potentially multiple evolutionary solutions for the same problem, and a bacterium’s genetic background may predetermine its evolutionary trajectories. The most fascinating mutation occurred in a regulatory protein known as XylR. The usual function of this protein is to regulate the use of xylose. As little as two amino acid alterations in the XylR can improve the use of xylose and liberate the glucose repression, even in the case of non-mutated original hosts. The Researchers employed certain smart genetic gimmicks to place the XylR mutant into a usual “wild-type” strain, or an industrial E. coli biocatalyst, and discovered that the bacteria were now able to grow on both glucose and xylose, thus largely enhancing the yield. Wang and his colleagues recorded nearly a 50% improvement in the product following fermentation for four days. At present, Wang and Cartwright’s invention has remarkably stimulated the ability of industrial E. coli to be employed for producing biofuel from lignocellulosic materials. Moreover, the same genetic technology could be applied for other E. coli strains for synthesizing various other products. Arizona Technology Enterprises (AzTE) have filed for a non-provisional patent for their invention. Wang believes that they can collaborate with industry to enhance their technology and to investigate whether this discovery will improve economic viability for bioproduction. With these new results, I believe we’ve solved one big, persistent bottleneck in this field.